"This is why silicene is so important. It might take you to that ultimate [size] limit," said Lok C. Lew Yan Voon, a nanomaterial expert from Wright State University in Ohio who coined the term "silicene" in 2007. According to Lew Yan Voon, electronic devices based on silicene could reliably exhibit the critical on-off function required for transistors, the building blocks of computers. 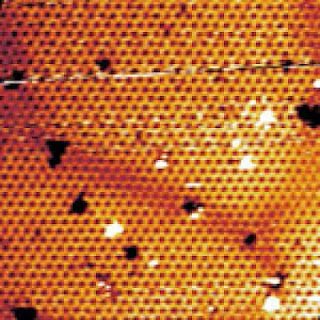 Graphene, however, has struggled to achieve this function, stymieing its practical use as a transistor. "The electronics industry is fighting against carbon," said Guy Le Lay, a silicene researcher from Aix-Marseille University in France. "To change to graphene, in principle, would be very nice, but it's very complicated." Because electronics manufacturers have built an infrastructure around silicon, they remain hesitant to fully embrace graphene as the basis for future super-fast processors. Silicene, however, presents an attractive prospect, according to its proponents. In a forthcoming research paper, Le Lay and his colleagues claim to be the first group to have clear proof of synthesized silicene sheets. The work will appear in Physical Review Letters. Le Lay hopes that this research will segue into transistors soon. "The aim is to have a demonstration of a device in two and a half years," said Le Lay. The advantage silicene transistors would have over their graphene counterparts stems from silicene's unique structure. In silicene, a few silicon atoms exist above and below the main two-dimensional surface and electrons in these two regions have distinct energies. Applying electrical voltages enables electrons to jump across this energy gap and allows silicene to transition between an "on" and "off" state. Le Lay's team claims to have created the first sheets that pave the way for such applications. But Le Lay and his colleagues have several competitors. Research groups from China and Japan recently unveiled similar results, and another team announced the synthesis of silicene in an Applied Physics Letters paper published in late 2010. The latter group, however, didn't have enough proof to make that claim, said Le Lay. Le Lay added that the Japanese group does not have as much evidence as his group. "[Le Lay] wants to own the fatherhood of silicene like it's his thing, but actually it's not," said Abdelkader Kara, a theoretical physicist specializing in silicene at the University of Central Florida in Orlando and coauthor of the 2010 research paper. Although Kara's group claimed to have synthesized silicene in 2010, they only used one detection method to prove their claim: scanning tunneling microscope images. The device relies on quantum-mechanical effects to produce images on the atomic scale, with greater detail than images from traditional microscopes. Such images, however, can be deceiving. According to the French team behind the newer research, the 2010 results didn't conclusively indicate that silicene was formed. Instead, something subtle was cropping up in the images, Le Lay's group claims. Most silicene researchers have been attempting to grow silicene on top of silver because silver atoms and silicon atoms don't interact strongly. While this allows the silicene to form independently from the silver substrate, it can be difficult to differentiate between genuine silicene sheets and silver structures, said Le Lay. "There's something tricky with the silver surface. The silver surface can mimic the honeycomb surface that looks like silicene," said Patrick Vogt, a silicene researcher at Technical University of Berlin and lead author of the forthcoming research done with Guy Le Lay. "The real silicene structure looks different." Kara counters that they had sufficient proof for silicene synthesis back in 2010 based on how the silicon atoms aligned themselves at an angle with the silver substrate. The microscope images revealed a honeycomb structure that the silver surface could not have formed alone, said Kara. "[Scanning tunneling microscope] images of course can be deceiving," said Kara. "We did a very careful job of looking at the silicon, and that's why the paper was accepted [for scientific publication]." Nonetheless, Le Lay and Vogt weren't satisfied. To ensure that they had truly created silicene, Vogt's research group analyzed their sample in a number of ways. They measured electrical and chemical properties in addition to comparing actual images with simulated theoretical predictions. Proving the synthesis of silicene requires converging evidence from these different sources, said Le Lay. Also, the team found that the observed distance between the silicon atoms matched theoretical predictions better than the results from 2010. Kara agrees that Le Lay's team took an important step forward in silicene research, but he believes that they don't deserve too much credit for silicene's discovery. Kara added that the credit for pioneering experimental silicene research should go to his colleagues, Bernard Aufray and Hamid Oughaddou, who worked on the 2010 paper. Wright State's Lew Yan Voon, who wasn't affiliated with either Kara's or Le Lay's research, acknowledges that there were some discrepancies between the 2010 paper and theoretical predictions. Consequently, it remains unclear who synthesized silicene first, said Lew Yan Voon. "The positive note is that more and more groups are reporting [synthesis of silicene]," said Lew Yan Voon. "There was a time when people said you couldn't even create it." Despite the uncertainty over who created silicene first, researchers agree what needs to be done next. To take full advantage of silicene's properties, physicists need to grow it on an insulating material that won't conduct electricity like silver. Once silicene can be grown on an insulator, it will be much easier to develop silicene transistors and other devices. Scientists may develop silicene devices that dramatically increase processing speed relatively soon, but large challenges remain, according to Le Lay. "From this to applications is another big step. It's not trivial," said Le Lay.